The real cause of the carrot explosion is their arrival in every CSA box we’ve received over the past few months. I love carrots, I’m glad they’re in the boxes, but I need to do better at keeping up with the inflow. A new CSA box is arriving today, and yes, it will include another bunch of carrots. Last night, I took the carrot overflow problem in hand and made a wonderfully flavorful Moroccan Chermoula and Carrot Soup. 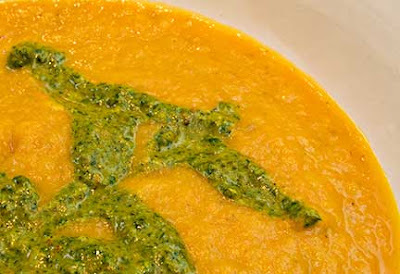 Although Carrot Soup is delicious on its own, the addition of Chermoula turns it into something special. I make the Chermoula while the soup is simmering, which means the entire recipe takes less than an hour from start to serving. It’s hard for me to get enough Chermoula – I usually double or triple the recipe whenever I make it. 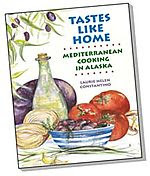 I use the extra Chermoula to top grilled salmon, halibut, or chicken, or to add flavor to salads. Thank you for this amazing sounding (and looking) entry Laurie. I have some large carrots in my fridge and will have to give this a try at some point. Excellent! I have a few extra carrots lying about in the vegetable drawer as well and this looks like a great way to make use of them. Thank you Laurie! Carrots are one of the most versatile vegetables I can think of: stews, soups, salads, cakes. We love them as a snack, too! I love the colours in the soup Laurie. Chermoula is so versatile and delicious. A great combination with the carrots. Lisa and Sam, you are both so welcome! If either of you make it, I'd love to hear how it turns out for you. Suganya, mmm, I love carrot salad; the simpler the better. Thanks for reminding me. Maria, I agree, carrots are a kitchen essential, for all the reasons you say. Peter G., now if I only had your photographic skills...sigh. But I do love my colorful food. Laurie, it's lovely to see you back, and with so many beautiful, delectable things. Carrots do seem to multiply in CSA-style boxes - I did laugh! Chermoula must be the most incredible flavour addition to the sweetness of the carrots. Great stuff. This is so great, because we are always on the same wavelength now with our CSA baskets. Carrots, squash and oranges and artichokes. This sounds fabulous, I'll have to try it tonight. Nuria, this soup is beautiful and healthy, what more could you want? Lucy, chermoula goes so well in just about everything. And in the CSA box I picked up the day I wrote this, there were TWO bunches of carrots - now that really made me laugh! Riana, CSA coordination - how perfect! I hope you like it. That's a great recipe -- I never think of carrots as a soup base. My favorite part of your post, though, is the instruction to whack the ginger with a meat pounder -- I love discovering new uses for rarely used tools as much as learning about new ingredients! I wonder if either of these soup recipes would work for butternut squash. My CSA has us drowning in squash. The other veggies we get to mix and match but cabbage and squash are a part of the haul. Manju, I love my meat pounder and use it often! Hippo, I'd say yes definitely, either this one or the Carrot Ginger could both be made with Squash. There's also a really good squash soup recipe on the blog (and a couple other squash recipes). I have exactly the same problem you do with accumulating squash from my CSA box.